The Southern Door Community Auditorium will present Late Nite Catechism on Saturday, February 23, 2019 at 7pm. Late Nite Catechism is an uproarious piece of theater that takes audience members back, sometimes nostalgically, sometimes fearfully, to the children they once were. The Irrepressible Sister teaches an adult catechism class to a roomful of “students” (the audience). Over the course of the play, Sister goes from benevolent instructor, rewarding the “students” for correct answers with glow-in the dark rosaries and laminated saint cards, to authoritative drill sergeant. These abrupt mood swings are bound to strike a resonant chord with everyone who survived the ups and downs of going to school, with an omniscient authoritarian at the helm. Late Nite Catechism, written by Vicki Quade and Maripat Donovan, made its debut May 28, 1993 at the Live Bait Theatre in Chicago, Illinois and since then has grossed over $100 million in box office receipts. It has been presented in over 410 cities around the world, has played 6 countries with over 3.5 million people in attendance. The show has raised over $4 million for retired Sisters and Catholic Organizations. There have been over 100 “Sisters” presenting the 8 shows now in the series. 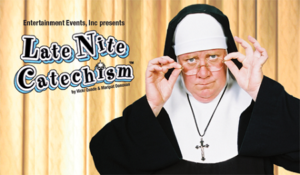 Late Nite Catechism is the longest running one-woman show in off-broadway history. Tickets can be purchased online at www.southerndoorauditorium.org. Adults $15, seniors $12, and youth $8.00. Tickets can also be purchased at the Southern Door School and District offices at 2073 County Trunk Highway DK in Brussels.